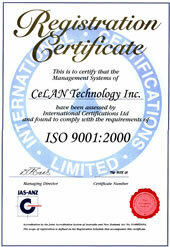 Also as noteworthy as the ISO-9001 certification is CeLAN's track record of 99.98% yield rate in average. Equipped with advanced facilities, but it's with our people that truly distinguish ourselves. Customers can experience the difference in our flexibility, problem solving abilities, our depth of engineering, and most importantly, our commitment to treat customers' products as our own. Also as noteworthy as the ISO-9001:2000 certification is CeLAN's track record of world-class yield rates. Equipped with advanced facilities and professional engineers, customers can experience the difference in our flexibility, problem solving abilities, our depth of engineering, and most importantly, our commitment to treat customers' products as our own. No.12, Kuang Fu S.Rd., HsinChu Industrial Park, HsinChu Hsien, Taiwan, R.O.C.